お問い合わせ | Tanaka Metal Factory CO., LTD.
Q.Can I replace the showr head myself? A.Yes. While many people think they can’t do it, it is very easy to remove the old shower head byunscrewing it counter-clockwise. The new Ariamisto Bollina shower head is just as easily screwed on. If the old shower head cannot be removed by hand, wearing rubber gloves will make it easier to grip and turn. Q.Which manufacturer’s shower hose will Ariamisto Bollina fit? Q.Can I use the shower in areas with low water pressure? A.The water flow may be poor in areas with extremely low water pressure. The water saving rate may also be affected due to water pressure or the location the shower head is installed. There are water valve apapters included (Ariamisto x3, AriamistoⅢ x4) that are suitable for low water pressure areas. Q.Can I install the valve? A.Yes. Initially adapter #2 is installed. You can change the valve according to your own preference. Remove the shower head from the hose. Remove the valve using a screw driver. Replace it with another valve. A full description is included with the product. This is available on Ariamisto (TK10001) and Ariamisto (TK-1003). Q.What is the difference between micro bubble and micro nano-bubble? A.A micro bubble is said to be 50μm in diameter whereas a micro nano-bubble is 0.1μm in diameter. 0.1μm is 1/10000 of 1mm so obviously it is not visible with the naked eye. Micro bubles will be generated in the water, float to the surface and disappear whereas micro nano-bubbles are much smaller and will remain in the water for a long period of time. Q.Do you produce original OEM products? A.Yes. We will produce this with the Bollina and Bollina PRO shower heads. 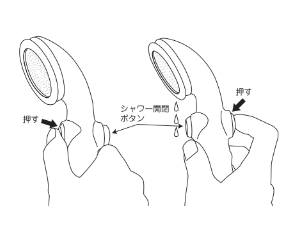 We have already produced a first official shower head in Japan with the FC Gifu original Bollina shower head. It is made in the official FC Gifu color with the FC Gifu logo engraved on the metal shower area. We can accept any kind of order. Please feel free to make an enquiry. Q.I heard you are doing demonstration sales? A.Yes. Demonstartion sales give customers a chance to experience the Bollina water feeling on their skin. We recommend this for any customers thinking about buying our product. The time and place can be seen on the “Demonstration Sales Schedule” (homepage) or on our Facebook. Please come and visit us. Q.Is it ok to use the shower water in the bath? A.Bollina and Bollina PRO utilize the「μ-Jet」technology so it is possible to use in the bath. The micro nano-bubbles will give the bathwater a warmer feeling for an enjoyable bath time. It is especially good for people with poor blood circulation and sensitive to coldness. A.Yes. The water pressure should be between 0.07MPa（0.7kgf/cm2）～0.75 MPa(7.6kgf/cm2). Water temperature should not exceed 60 ℃. A water rate of 0.15MPa can be tested that in 10 seconds 1.5 liters of water will flow. Q.What should I do if water is leaking from the base of the shower head? A.There could be a problem with the O-ring at the connection with the shower hose. You should replace the O-ring with the one specific to the hose manufacturer. Q.Water seems to be leaking from the Bollina Risaia shower head when I push the one-touch water button. Is it broken? A.The shower head is designed to leak to release water pressure when water is stopped using the one-touch button. There could be a problem with the O-ring at the connection with the shower hose. You should replace the O-ring with the one specific to the hose manufacturer. 1. To remind users to turn off the water at the faucet. 2. To stop the shower hose bursting from excess water pressure. The Tanaka Metal Factory (called “us” ) Co., Ltd. observes laws and ordinances about the protection of the personal information and, in conformity with the following policy, plans protection of the personal information. ■Collection of personal information On our homepage, in the case of follows, I collect the personal information of the visitor. ■Handling of personal information We do not sell trade or otherwise transfer to third parties your personal information without your consensus. We will comply with ‘the time of your use of the e-commerce in the private sector’ in the e-commerce demonstration Promotion Council, for the appropriate protection of personal information. In addition, personal information collected will be safely accumulated and stored under strict management.